Especially engineered for precise support, agility and speed during the fight, the Venum Hurricane Fight Shorts have been tested and adopted buy some of the most blistering MMA and BJJ Fighters: Lyoto Machida,José Aldo and Rodolfo Vieira. 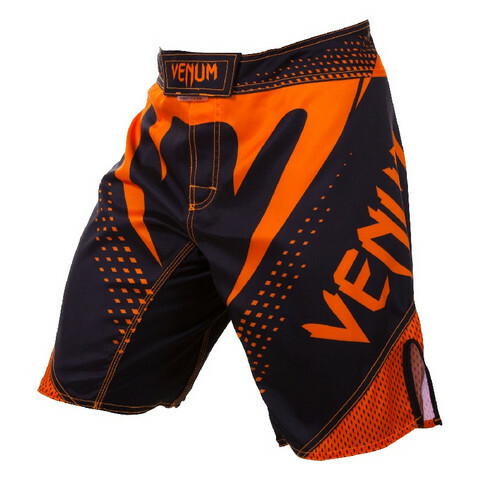 Designed as the perfect MMA Shorts, the Venum Hurricane Fight Shortsbenefits from a Venum 3-Way Vault&trade to guarantee a secure lock in each position and lateral slits to offer a wide range of moves. Exactly what you need to blow your opponent. Speed Grip&trade for an easier and faster adjustment. Pro-engineering Flex-System placed at the crotch extending your range of moves. Neo Orange Fluo Design for unmatched look.